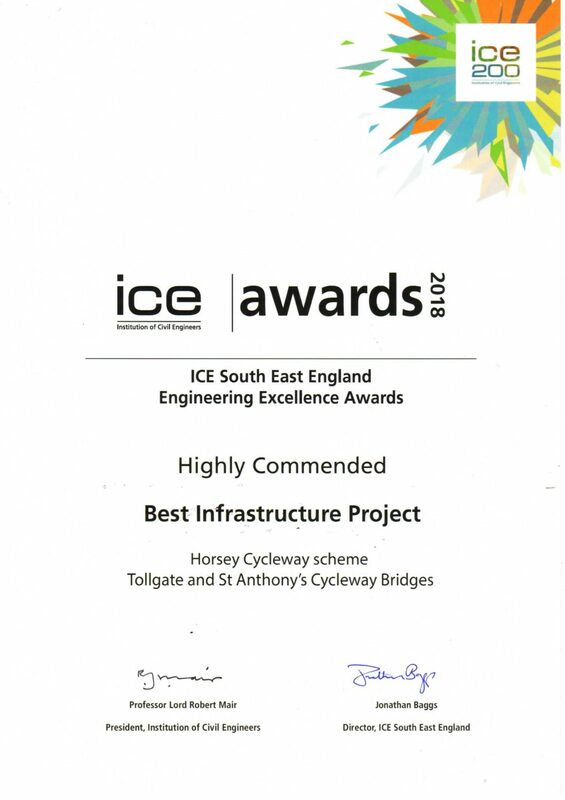 Lifespan Structures FRP cycleway Bridges on Horsey Way, Eastbourne, were highly commended at the 2018 ICE South East England Engineering Excellence awards in the best infrastructure category..no mean feat when going up against much larger schemes, congratulations to all involved in the project! The new Horsey Cycleway crosses a wetlands area where two footbridges with service vehicle access were required to cross waterways on the route. Due to the poor ground conditions the bridges needed to be lightweight to aid installation and reduce the abutment loadings. The client, had already used an FRP composite footbridge on a previous scheme and commissioned Lifespan Structures to design and manufacture the two FRP composite Footbridges. The bridges were both 3.0m wide and had clear spans of 14.8m and 10.6m with respective deck weights of 5600kg and 3350kg. The bridges were designed to BD90/05 standard with a 60 year design life and provided over a 50% reduction in carbon and energy embodiment when compared to the steel footbridge option. The parapets are 1.4m high galvanised steel and powder coated. The bridges were designed with a longitudinal camber to improve aesthetics and the client was able to select a colour scheme which complemented the surrounding environment.